Healthcare-acquired infections (HAIs), also known as nosocomial infections, are infections that patients get while receiving treatment for medical or surgical conditions. HAIs occur in all settings of care, including hospitals, surgical centers, ambulatory clinics, and long-term care facilities such as nursing homes and rehabilitation facilities. All hospitalized patients are susceptible to contracting a nosocomial infection. Some patients are at greater risk than others-young children, the elderly, and persons with compromised immune systems are more likely to get an infection. Other risk factors are long hospital stays, the use of indwelling catheters, failure of healthcare workers to wash their hands, and overuse of antibiotics. Patients who acquire infections from surgery spend, on average, an additional 6.5 days in the hospital, are five times more likely to be readmitted after discharge and twice as likely to die. Moreover, surgical patients who develop infections are 60 percent more likely to require admission to a hospital's intensive care unit. Surgical infections are believed to account for up to ten billion dollars annually in healthcare expenditures. What are Providers Are Doing to Prevent HAIs? providers wearing hair covers, masks, gowns and gloves when appropriate. Healthcare providers are making great strides to reduce, and in some cases eliminate, HAIs. In this section resources are identified and case study examples are highlighted to assist healthcare providers to improve the prevention of HAIs. How Can You Protect Yourself Against HAIs? The CDC has released these example questions for patients to raise to their nurses and doctors to protect themselves from Healthcare-associated Infections. The checklist (link below) is a companion to Core Elements of Hospital Antibiotic Stewardship Programs. This checklist should be used to systematically assess key elements and actions to ensure optimal antibiotic prescribing and limit overuse and misuse of antibiotics in hospitals. CDC recommends that all hospitals implement an Antibiotic Stewardship Program. Antibiotics Resistance Threats in the United States, 2013 is a snapshot of the complex problem of antibiotic resistance today and the potentially catastrophic consequences of inaction. The overriding purpose of this report is to increase awareness of the threat that antibiotic resistance poses and to encourage immediate action to address the threat. This document can serve as a reference for anyone looking for information about antibiotic resistance. It is specifically designed to be accessible to many audiences. The American Recovery and Reinvestment Act of 2009, Public Law 111-5 (ARRA), was signed into law on February 17, 2009. Within the Recovery Act, $50 million was authorized to support states in the prevention and reduction of healthcare-associated infections. Many of these funds are being used to support activities outlined in the HHS Action Plan to Prevent Health Care-Associated Infections. This CDC site tracks states' efforts to meet the goals of the plan and the results can be located on the CDC Healthcare-Associated Infections: Recovery Act site. CDC is assisting states in this process with implementation tool kits located at Premier's Safety Institute's Healthcare-Associated Infection Web site. 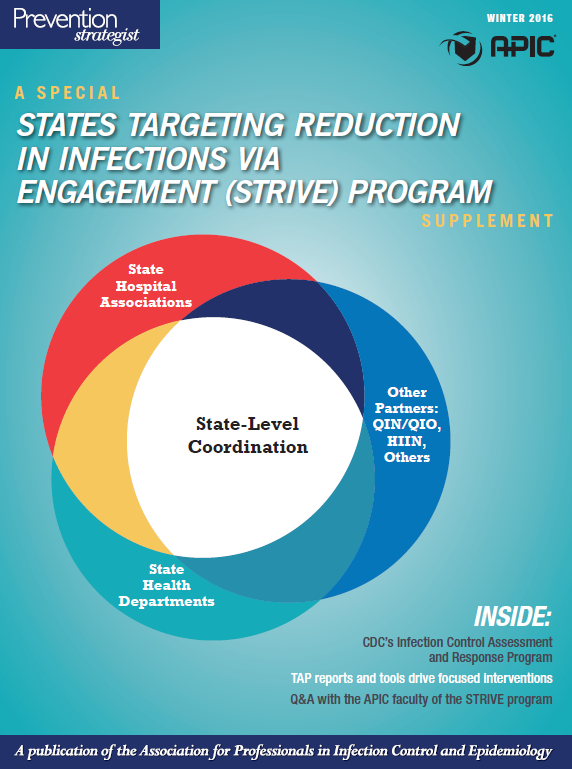 APIC IS pleased to be a partner of the States Targeting Reduction in Infections via Engagement (STRIVE) program, funded by the Centers for Disease Control and Prevention (CDC) and facilitated by the Health Research & Educational Trust (HRET). Closely aligning with APIC’s mission to create a safer world through prevention of infection, the program’s purpose is to substantially reduce healthcare-associated infections (HAIs) occurring in hospitals that have persistently elevated infection rates of central line-associated bloodstream infections (CLABSIs), catheter-associated urinary tract infections (CAUTIs), Clostridium difficile (C.diff) infections, and methicillin-resistant Staphylococcus aureus (MRSA) bacteremia. To help achieve this goal, the program uses various CDC tools including the Targeted Assessment for Prevention (TAP) strategy,which is used to identify facilities with an excess of infections. Utilizing TAP helps healthcare facilities identify, assess, and target prevention efforts where they are most needed. It also aligns with APIC’s strategic goals. The Joint Commission has announced the launch of a Web-based portal that allows health care providers to access information and resources on health care-associated infections. A list of related performance measures. The National Healthcare Safety Network now offers reports that can help hospitals target their infection prevention efforts, the Centers for Disease Control and Prevention announced today. The Targeted Assessment for Prevention reports allow authorized users to identify facilities within a group or units within a facility with more infections than predicted based on Standardized Infection Ratio targets for catheter-associated urinary tract infection, central line-associated bloodstream infection and Clostridium difficile. "AHA is pleased that CDC is making this tool available to hospitals that are looking to make further strides in reducing infections by being able to target areas that may provide the greatest opportunity for improvement," said John Combes, M.D., AHA senior vice president and chief medical officer.